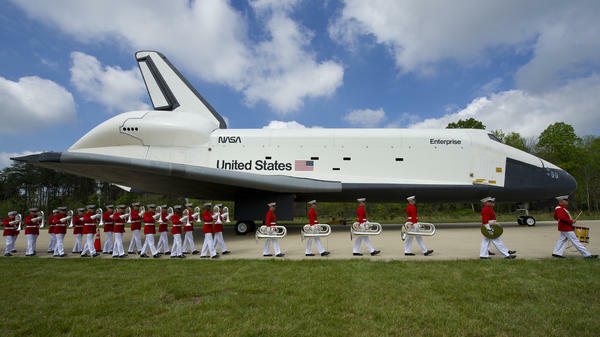 U.S. Marine Drum and Bugle Corps and Color Guard march past the space shuttle Enterprise at the Steven F. Udvar-Hazy Center on April 19, 2012, in Chantilly, Va.
Trump previously floated the idea of a space corps in March in a speech to military members in California. The proposal, which has received congressional support in the past, is facing criticism from the Pentagon. The creation of such a force would mark the first new military branch since the Air Force was established in 1947. "I was saying it the other day – 'cause we're doing a tremendous amount of work in space – I said, maybe we need a new force. We'll call it the space force," Trump said in March. "And I was not really serious. And then I said, what a great idea. Maybe we'll have to do that." In fact, the military has conducted operations in space for a long time, says Terry Virts, former commander of the International Space Station and a 30-year veteran of the U.S. Air Force. For Virts, the debate is "not advocating for somehow militarizing space. That happened 50 years ago," he tells Here & Now's Peter O'Dowd. "Every nation on Earth that has a significant military has some space component to it. What I'm advocating for is really making it more efficient and a more effective way to organize the military." Most of the country's military operations in space are handled by the U.S. Air Force Space Command, a division of the Air Force that employs about 36,000 people at more than 130 sites around the world. One of the Space Command's main priorities is to operate GPS, weather and communication satellites, Virts says. "A big part of what Space Command does is called space situational awareness," he says. "They track objects in space and keep track of what other countries are doing in space. There's a lot of what happens in space that directly affects combat operations in the Army or Air Force or Navy." For years, the Pentagon has opposed the idea of creating a space force because leaders argue it would make the Defense Department bureaucracy more complicated. "The Pentagon is complicated enough," Air Force Secretary Heather Wilson told reporters last June. "This will make it more complex, add more boxes to the organization chart and cost more money. If I had more money, I would put it into lethality, not bureaucracy." Last year, Reps. Mike Rogers, R-Ala., and Jim Cooper, D-Tenn., spearheaded an effort within the House Armed Services Committee to shift the Air Force Space Command's duties into a separate service that still reports to the secretary of the Air Force. The measure was included in the House version of an annual defense bill, but the Senate version removed it. "Russia and China are surpassing us in Space capabilities and we need to dedicate a separate force solely with a Space mission," Rogers said in a statement. "The future of war will be fought in Space, and we must stay diligent ahead of other countries for our own national security." The Rogers-Cooper proposal to create a new space force wouldn't have impacted NASA, and it was designed to safeguard the military's budget for space, which the Air Force has used to cover cost-overruns for other department projects, the lawmakers argued. The concept of a space force goes back to the Cold War. The idea gained renewed traction in 2000 when Donald Rumsfeld, who later became President George W. Bush's defense secretary, proposed creating a space corps in a military-reform commission report. But any plans to establish a space force were derailed by the Sept. 11, 2001, attacks and the wars in Afghanistan and Iraq. Some critics of creating a space force argue the U.S. shouldn't spread its military footprint any further, but Virts says space is already a significant part of the military and removing military satellites from space would have consequences. "It would certainly really hurt our forces down here on the ground," he says. 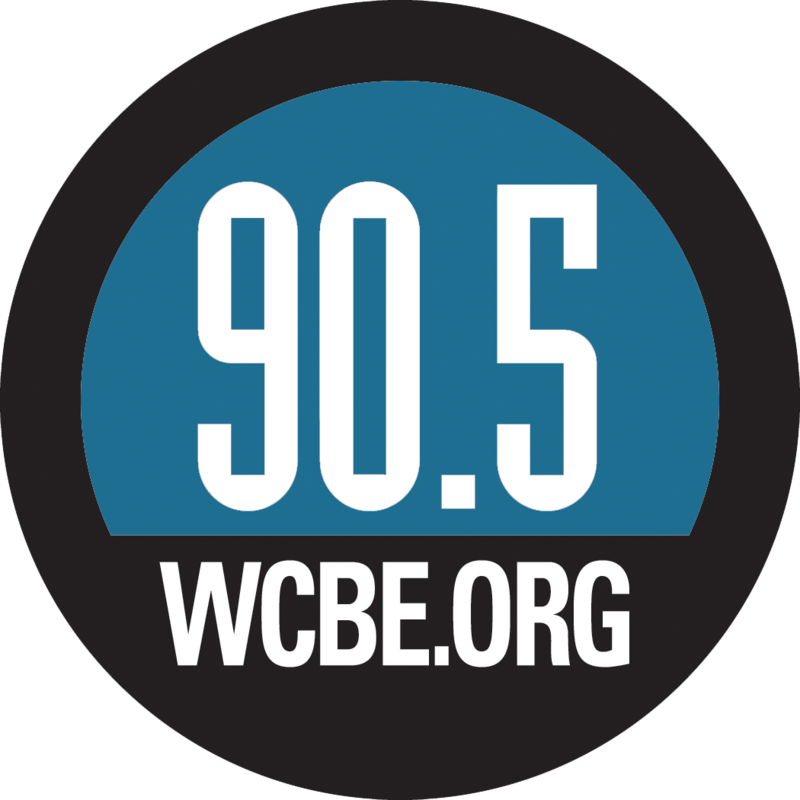 "The debate that we're having right now is not about increasing, somehow weaponizing further, space it's about really the best way to organize our forces."